West Bromwich Albion's Craig Dawson (centre) and Jay Rodriguez (right). Burnley will have to up the ante if they are to land West Brom duo Jay Rodriguez and Craig Dawson. The Clarets’ opening gambit of £25m has not tempted the relegated Baggies, who have already lost centre back Jonny Evans to Leicester City, who triggered a £3m release clause in his contract. And it seems that, with striker Salomon Rondon also having a £16m release clause, Burnley may have to bide their time while West Brom line replacements up, with Newcastle United also linked with a move for the Venezuelan. 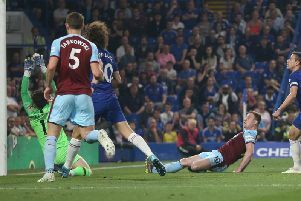 Sean Dyche is eager to add to his squad, with an earlier start to the season, with the Clarets due to open their Europa League campaign on July 26th with a second qualifying round first leg tie. But it would certainly be no surprise if either Rodriguez or Dawson ended up at Turf Moor, with Burnley offering not only Premier League football, but European football. And, for both, it would be a move closer to home, with Rodriguez, of course, Burnley born and bred, while Dawson was born in Rochdale, starting out at Radcliffe Borough before his breakthrough at his hometown club. Former Clarets striker Rodriguez is believed to have six Premier League clubs interested in his signature, but the club hold the trump card in that the 28-year-old is known to prefer a return ‘home’ if, as expected, he is to leave The Hawthorns this summer. Rodriguez scored 11 goals in 42 appearances for the Baggies last season, having arrived on a £12m deal from Southampton last July. Bournemouth, West Ham and Crystal Palace are believed to be among those eyeing Rodriguez, who prospered at Burnley under Cherries boss Eddie Howe, scoring 21 goals in 42 games in Howe’s only full season in charge at Turf Moor in 2011/12. There has also been spoeculation that his former boss at Southampton, Mauricio Pochettino, is keen on reuniting at Spurs. Burnley were interested in a return for Rodriguez last summer, but, on top of his transfer fee, his wages proved prohibitive, signing a £65,000-a-week deal at the Hawthorns. However, many of the current Baggies squad are believed to have seen their wages halved upon relegation. Dawson signed a new, improved three-year deal last August, believed to up his wage into the £50,000-a-week bracket. Howe tried and failed to bring Dawson to Burnley on loan in 2012, before he ultimately ended the season on loan at Bolton Wanderers, while Sean Dyche also tried to lure the former Rochdale man to Turf Moor in the summer of 2014, after Burnley were promoted to the Premier League, only for the Baggies to, three times, rebuff his advances, despite Dawson putting in a transfer request, which was rejected by the club. Dawson ended the season alongside Egypt international Ahmed Hegazi in the West Brom side at centre back, after spending much of his time at the club at right back. He has made 180appearances for West Brom, scoring 12 goals, and has been capped at England Under 21 level, while also representing Team GB at the London 2012 Olympics. However, while Burnley have also been linked with a move for a third West Brom player in Scotland winger Matt Phillips, it remains to be seen whether that interest firms up, as they weigh up their options in terms of adding to their options in that department.